To celebrate their 15th edition, EXIT festival is inviting you on a seven-day EXIT Adventure in two different countries. 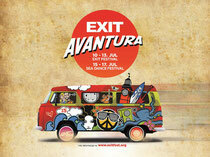 In 2014 EXIT will be held at the Petrovaradin Fortress in Novi Sad, after which the party moves on to a beautiful beach on the Adriatic Sea in Montenegro. With its central stage and camp site at the Jaz beach, the festival finally gets its "sea" edition, named Sea Dance Festival.